On Saturday I was honoured to offer my services for Blossoming at the Farm's first Family Fun Day. This fundraiser was to help highlight the programming of this wonderful school, the beauty of the farm and the work they do there and the proceeds went towards providing accessible programming for children and youth. The whole day was amazingly fun. There were farm games, face painting, animal interactions (who doesn't like feeding llamas?) disc golf and so much more! I was there to photograph the families or fairies that crossed my path and I had a ton of fun with it! And of course I have to give a special thanks to my two little men who helped me all day (glitter count down anyone?) and had the biggest smiles on their dirty, candy fuelled faces at the end of the day! Here are some of my faves from the day! My lovely, talented and generous friend Tania runs a beautiful forest school; Blossoming at the Farm. I love to follow their Instagram and see what beautiful art they are creating, the adventures they go on, the things they learn in nature and how they interact with the animals and farm. I was overly excited when she messaged me and asked if I would come do a little "Lost Boy" and Fairy session with some of the kids because I know that they truly are Fairies and Lost boys at heart and I was not disappointed. 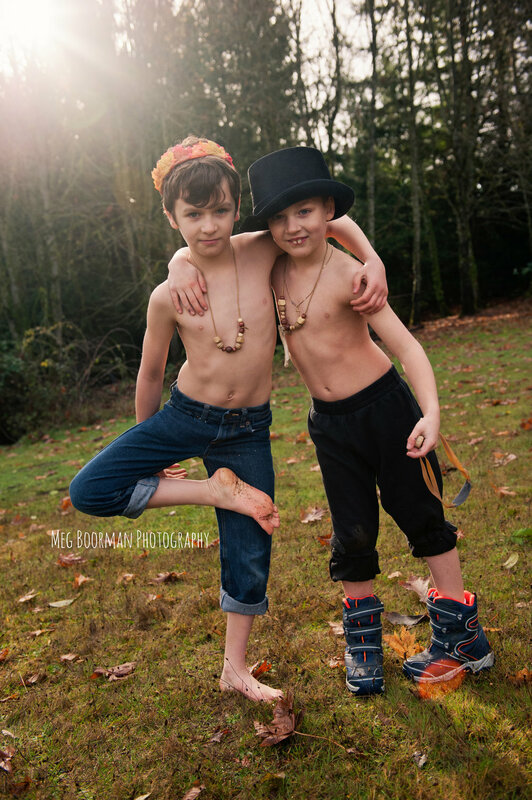 These kids jumped at the chance to get dressed up, to be creative with their costumes, and most importantly to run barefoot through the November forest and embrace the characters they made! It was a morning of pure magic. And the horses even cooperated when their friends came over to visit in costume! And even Tania's daughter Hannah, who teaches at the farm, got dressed up for me! I can't say enough times how amazing and fun this shoot was and I hope we do it again soon!